So yesterday there was a bit of a lag time between the two workshops. During that time, those in attendance and I struck up a conversation about how Aquaponics is going to be able to alleviate some of the issues that currently exist relating to traditionally farmed fish. In the course of that conversation, I touched on a number of issues from the waste water release problems and the unsustainable nature of the feeds used, to technological issues and even marketing campaigns. 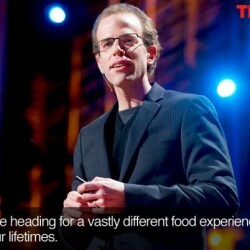 I also remembered a GREAT video that I had watched (the first time) about a year ago on TED by an amazing presenter named Dan Barber. Now Dan Barber is a Chef at a rather prestigious restaurant in New York (or at least he was at the time) and he is also a very staunch supporter of local foods and seasonal eating — i.e. the fact that we are supposed to eat the things that are actually produced NEAR where we live!!! Imagine that radical concept! Well in his talk, he talks about a few encounters that he has had in his life with fish. These “love affairs” that ensued are described in a clear, and witty manner that engages the audience and holds our attention solid and focused. At this point I have probably watched this video 30+ times, and each time, I manage to catch something new or I get a slightly better understanding of how pieces fit together. The example that he presents of the fish farm (that really isn’t a farm), is close to what I think Aquaponics can actually be for the urban environment. The pieces are all around us and the capability is within our grasp — personally, I think that we just need to work together to develop a slightly different operation strategy for the future.